Not a lot happens in The Home and the World, but a lot is felt and thought and said. The novel explores male and female gender ideals, the changing role of women in the modern world, and approaches to political change. It showcases contrasting character traits: patience and impulsivity, thoughtfulness and recklessness, candor and cunning, generosity and jealousy, conscientiousness and ambition, practicality and idealism. The main character, Bimala, is an Indian woman caught in a love triangle with her mild, loving husband Nikhil and the charismatic, impetuous nationalist Sandip. She has always had a place in the home, but what is her place in the world? See my Backlist books post on Asian Books Blog for more on this Bengali novel. See below for what stood out when I read it. In a world ravaged by ecological disaster and ruled by digital tyranny, a father buys and stocks a ship so that his daughter can live in ease and comfort among 500 specially selected people, out of reach of the collapse of civilized society. Are the girl and her mother really on board with this whole plan, though? Read The Ship to find out what’s in store for those on the ark. Or don’t. Personally, I can’t recommend it. See below for why. I don’t always read biographies, but I when I do, I read biographies of modern creative geniuses. Wish You Were Here tells the story of Douglas Adams, author of the comedy/sci-fi Hitchhiker’s Guide to the Galaxy Trilogy. Biographer Nick Webb gives readers insights into the beloved author’s family background, his personal and professional struggles, and his ultimate phenomenal success. What I especially appreciated, in addition to peeks into the media industry, was Webb’s characterization of Adams’ unique and thoughtful approach to life, the universe, and everything and the reminder that even those whose works spawn devoted global cults often start out as starving artists perpetually unsure whether the world will ever care what they have to say. Douglas died suddenly in 2001, but his works continue to inspire. Like the third installment of The Matrix, this book goes off the rails—which is maybe what you’d expect for the fifth book in a comedy/sci-fi novel series. It’s longer, darker, and more complicated than the others, and has more narration (less dialog) than its predecessors. The ending gives a sense of tying off loose ends, though there’s a sixth book published after the author’s death. Still, Mostly Harmless has its bright spots: the idea of Arthur becoming a revered sandwich master on a low-tech planet is one I cherish. 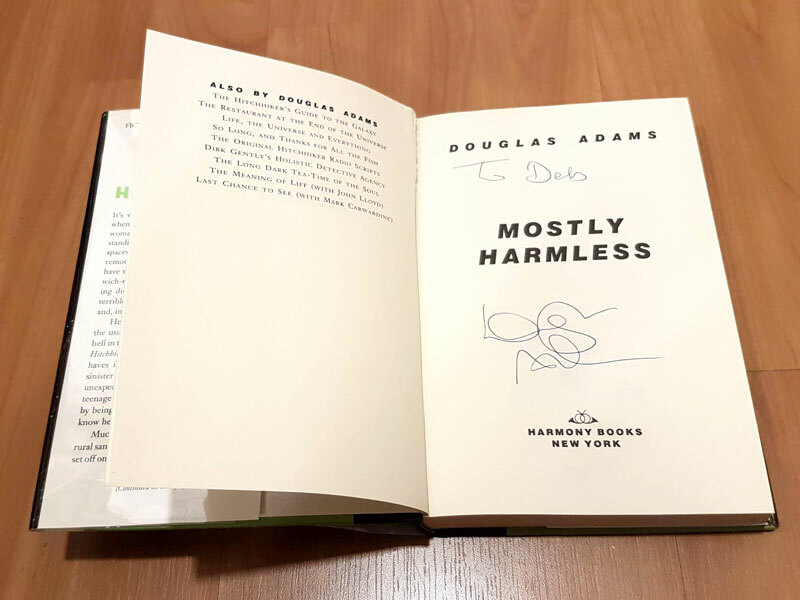 My first edition copy is signed by the inimitable Adams (though sadly not to me). I was prompted to re-read the series when a friend decided to throw a HHGTTG-themed party for her 42nd birthday. This fourth book in the Hitchhiker’s Guide to the Galaxy Trilogy by Douglas Adams is not as fun as the first three. Hapless human protagonist Arthur Dent isn’t roaming the galaxy anymore; he’s back on Earth somehow, even though the Earth was destroyed. Purely by accident, he falls and misses the ground, thus learns to fly. He also falls in love. First a BBC radio show and then a series of painstaking novels, later a BBC miniseries and later still a video game and even a Hollywood movie, The Hitchhiker’s Guide to the Galaxy Trilogy offers a multitude of zany insights into the the philosophical conundra of the ages. If you have not read the original book trilogy, do not stop, do not pass go, do not collect $200, and above all, don’t panic. Just go and read it right now. Dozens of pop-culture references and in-jokes will suddenly make sense, even though the books themselves often don’t, and you’ll be able to join in the annual Towel Day celebrations on May 25th. The books are available in a wide variety of styles and formats, but I love this cover art by Peter Cross. I bought these fantastic American book club edition hardcovers at a thrift store when I was in college. A friend in high school originally recommended the series and lent me her copy of the Hitchhiker’s Guide omnibus. The cover of Ready Player One says “Enchanting. WILLY WONKA meets THE MATRIX.” —USA Today. I thought it was more like Second Life meets Speed Racer meets Surrogates. OASIS, the book’s highly advanced and therefore seemingly magical virtual world, in some ways resembles Second Life, an online platform where user avatars can interact with one another in a variety of digital settings for business, education, entertainment, or personal reasons. In both cases, the world is fake but the social and economic relationships inside it are very real. The book embodies modern liberal values such as the superiority of science over superstition, the urgency of the need for alternative energy sources, the right to online anonymity, the idea that information (and thus education) wants to be free, the equality of all races, genders, and sexual orientations, the importance of inner beauty, the protection of basic human rights, and, of course, the inherent evil of money-grubbing mega-corporations run by villains who, like Speed Racer‘s E.P. Arnold Royalton, will not hesitate to take with deadly force whatever their obscene piles of cash can’t buy. To the extent that the book has a message, it’s that of the mediocre 2009 Bruce Willis movie Surrogates: the real world should be more important to humans than any substitute. However, the whole of Ready Player One seems to argue the exact opposite: “The digital world is really cool, guys! We can use it to live in our own retro-futuristic fantasy worlds, like, forever!” The moral of the story thus seems not just tacked on but insincere. What, then, is the point? The novel is an unsubtle homage to the pop culture of several decades set in a technologically superior “dystopia”, though anything with so much baked-in wish-fulfillment can’t possibly be properly dystopian, if you ask me. But hey. At least there’s a Firefly reference in there. See below for more thoughts on the novel as well as a plot summary with SPOILERS in the form of a beat sheet in the style described in Blake Snyder’s Save the Cat.